(Bloomberg) -- Don’t expect a major pact on China’s yuan. That’s what analysts are saying as U.S. officials arrive in Beijing for another round of negotiations for a comprehensive trade deal. 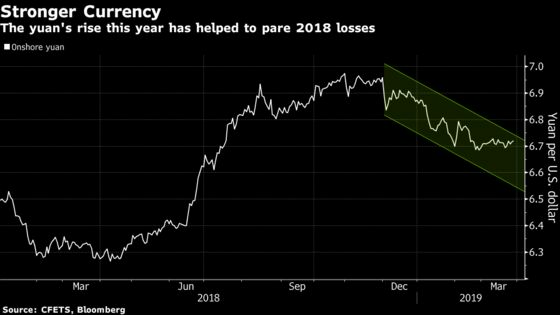 China’s case has been helped by a 2.1 percent rally in its currency this year, compared with 2018 when the yuan tumbled more than 5 percent amid the trade uncertainties and a slowing economy. The yuan was little changed at 6.7271 per dollar on Thursday after falling as much as 0.2 percent in early trading.